Careers, Personality, Compatibility, Best Places to Live, Strengths, Weaknesses, More. Learn yours and your competitors' strengths, weaknesses, attributes. The ultimate and only astrology and zodiac sign resource you will every need. Which month is which zodiac signs? 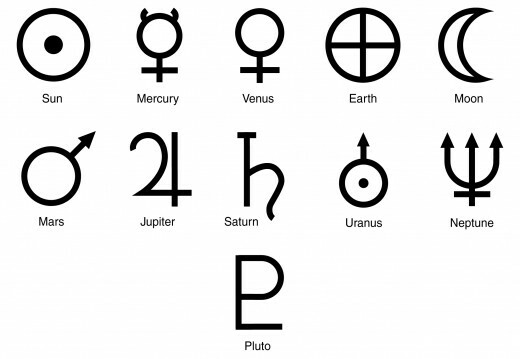 Ruling planet for each sign. Best compatibility and harmony potential with other signs. Best career paths and jobs for each sign. Best places to live for each sign. Birth stones and gem stones that are most supportive to and for each sign. Based on research, as opposed to whatever overstock some website is trying to sell you. 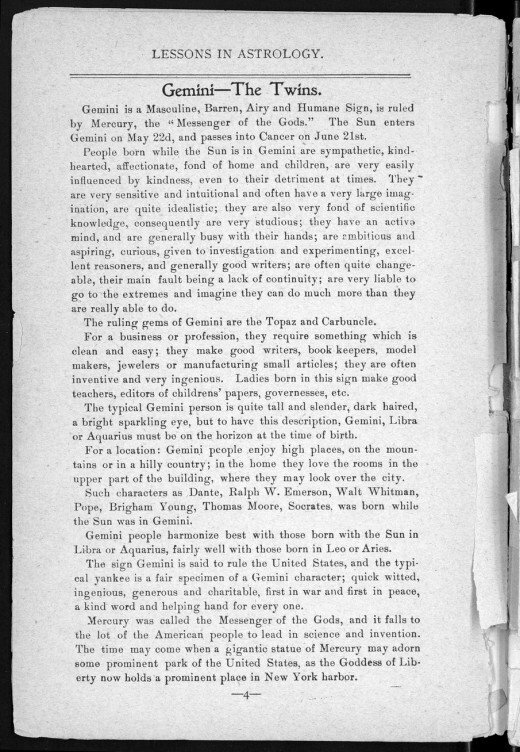 Readable images of corresponding original manuscripts. 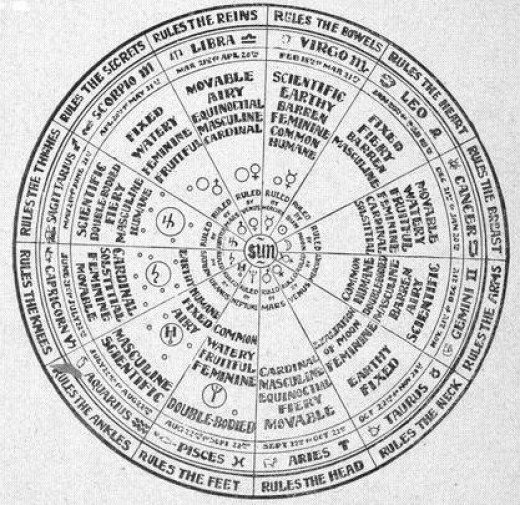 This is the true, original analysis of astrology for all 12 zodiac signs by Professor Fredrick White as written in “A Guide to Astrology”, published in 1901-1904. In other words, here is your information from the source without the 100+ years of modern interpretation and commercial modifications by others. All on one page. The 100+ year-old manuscript has been cleaned up and somewhat paraphrased for ease of Third Millennium reading. 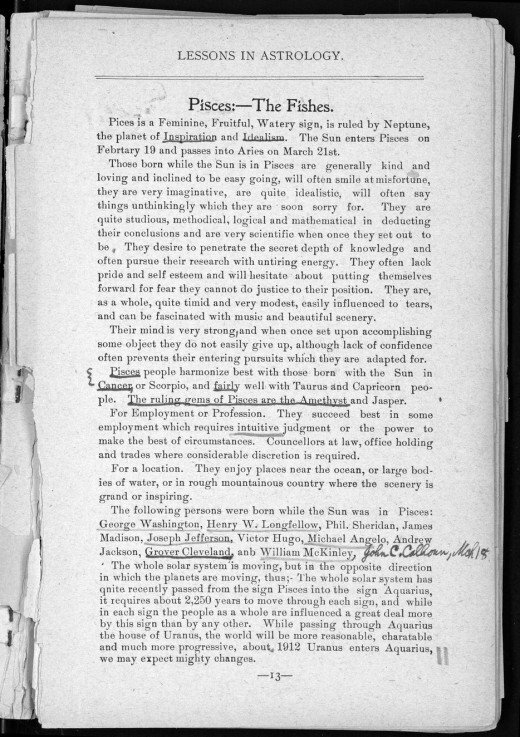 However, an image of the original, unaltered manuscript is also included. Ctrl+/- will adjust the size. For historical perspective and additional nuances it is well worth the read. Information for this article was compiled from United States (U.S.) government archives. 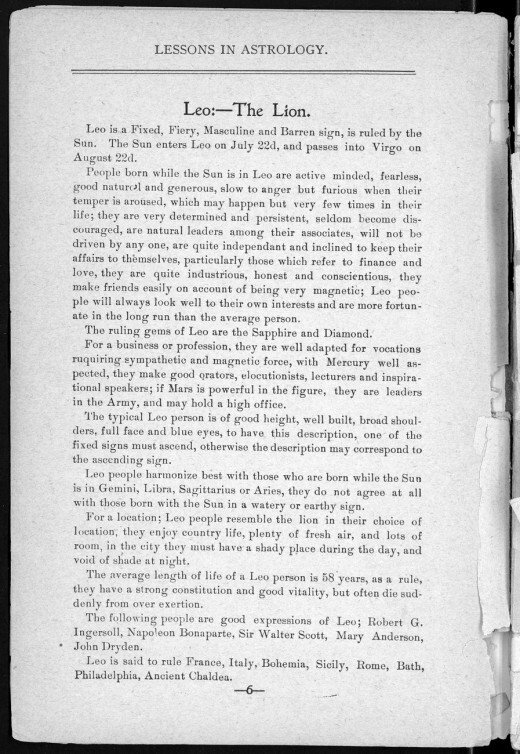 This manuscript addresses such items as personality traits, which signs each sign is compatible with, best careers and professions, which planet your zodiac sign is ruled by, gemstones and birthstones, sometimes historical notes, best places to live, and other basic and not-so-basic information. Aries is a fiery, masculine, movable, equinoctial sign. This sign is ruled by Mars (the God of War). The Sun enters Aries on March 21st and passes into Taurus on April 22nd. The Aries personality and traits include persistent and determination; can be very quick tempered, independent, and prefer leading rather than following; naturally dislikes subservience and prefers being their own boss. This sign admires scientific thought or philosophy. Aries have the desire to excel in whatever engages their attention. This sign is also defined as being fearless, ambitious, and not discouraged easily. Another personality trait is although quick in temper and quick to resent abuse, they are forgiving and do not hold a grudge long. Aries harmonize best with Leo or Sagittarius, and fairly well with Gemini or Aquarius. Aries have excellent vitality and good health. They strongly resist sickness and recover quickly. This personality has strong will-power and can influence others. Aries succeed best in vocations requiring quick, active temperament. They prefer professions requiring manual dexterity. Analysis is very dependent upon the hour of birth. 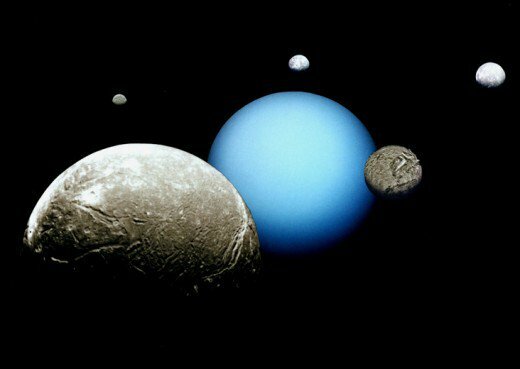 Certain planet configurations can also negate the generalities indicated by the position of the Sun. The Big City. Prominent and state capitals are even more preferred. Basically, the more metropolitan activity and excitement, the more successful and happy the Aries person will be. Aries people even prefer to live in corner houses, a fact that real estate agents love. The ruling gems for Aries are the Ruby and Sardonyx. Taurus is a fixed, feminine, cold, dry, earthy sign; ruled by Venus (The Goddess of Love). The Sun enters Taurus on April 22nd and passes into Gemini on May 22nd. The Taurus personality traits are self-reliance, plodding, slow and careful; gentle when unprovoked, but becomes furious when angered. Personality traits also include patience and a willingness to wait for the fruition of their hopes, dreams, and aspirations; tends to be headstrong and unyielding, but is very cautious and will go to great length to avoid pain. This sign is curious, inquisitive, and can be meddlesome; loves music, art, and the literary world, but are more inclined to be imitators rather than originators. Other traits are excellent logic abilities and reasoning faculties. Taurus people harmonize best with Cancer, Libra, Capricorn and Pisces. Taurus is of a strong and healthy nature, but can be more subject to chronic diseases than some. Very small towns or in the country. The less excitement and activity, the better. Quiet and shady places are their mantra. If forced to live in the city or large town environment, Taurus people want to be as far away as possible from the business centers and other active areas. Their house location preference is in the middle of the block. The Taurus person's preferred room location is in the center or side of the house. Taurus people succeed best at something requiring artistic talent and ideality. Some professions would be designers, sculptors, photographers, etc. The ruling gems for Taurus are the Emerald and Topaz. Taurus, Scorpio, and Aquarius are the favored signs for producing occult students. For this sign, the driving force and/or reason seems to be their idealism. 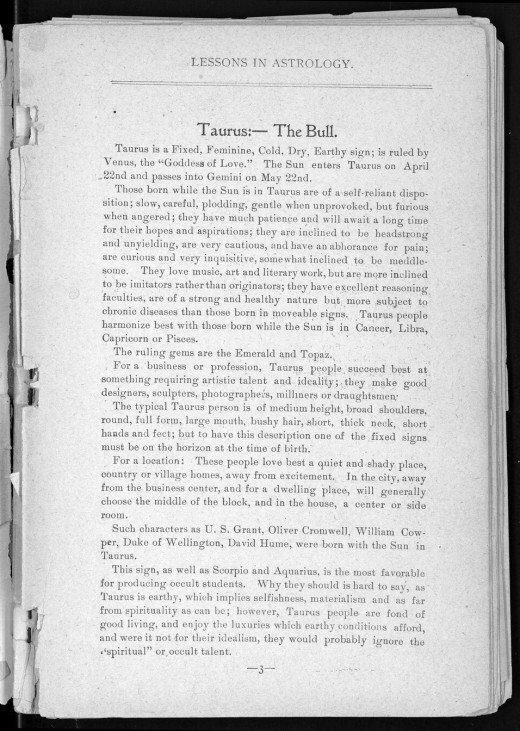 Several famous people were born under the sign of Taurus. See original manuscript below. The Gemini is masculine, barren, airy and humane; ruled by Mercury (The Messenger of the Gods). The Sun enters Gemini on May 22nd, and passes into Cancer on June 21st. The Gemini personality is sympathetic, kind- hearted, affectionate, and fond of home and children; easily influenced by kindness, even to the point of detriment. Other personality traits include a high degree of intuition and sensitivity. They have a large imagination and are quite idealistic. People born under this sign enjoy scientific knowledge and are consequently studious. This sign has an active mind and is generally busy with their hands; can be ambitious and aspiring. More personality traits include curiosity and is given to investigation/experimentation. They are excellent analysts and are generally good writers; can often be quite changeable. Their main fault is a lack of continuity. The Gemini is very likely to go to extremes and generally imagine they can do much more than they are really able to do. Gemini people are compatible and harmonize best with the Libra and Aquarius, and fairly well with Leo and Aries. For a business or profession, the Gemini requires something which is clean and easy. They make good writers, bookkeepers, model makers, jewelers or assemblers. They are often inventive and ingenious. Many are good teachers, professors, instructors, coaches, and trainers. The higher, the better. Gemini people prefer high places. If living in mountainous or hilly areas, the higher their residence is on the side of the mountain or near the top of the hill, the better the Gemini likes it. When living in a house or apartment building, they want the top floor in the house or the highest level in the apartment building complex. If they are living in a big city building; the closer to the penthouse, the happier they are. The ruling gems of Gemini are the Topaz and Carbuncle. The emerald represents the positive aspects of the planet Mercury. The sign Gemini is said to rule the United States. The typical Yankee is a fair specimen of this sign. He is quick witted, ingenious, generous and charitable; has a kind word and helping hand for everyone. First in war and first in peace. 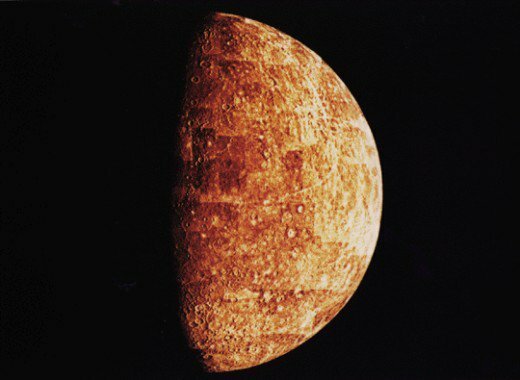 Mercury was called the Messenger of the Gods, and it falls to the American people to lead in science and invention. Someday a gigantic statue of Mercury may adorn some prominent place; just as the Statue of Liberty now stands in New York harbor. The Moon. Spectrum scanned and color coded to display composition differences. 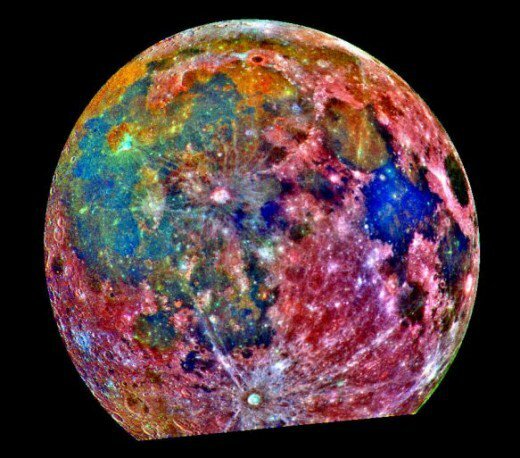 Cancer is movable, watery, cold, moist, feminine and is ruled by the Moon. The Sun enters Cancer on June 2lst and passes into Leo on July 22nd. The personality traits of people born under the sign of Cancer are retiring, patient, sensitive, kind and gentle. This personality is very averse to discord and disharmony. People born under this sign are known to conscientiously, tenaciously, and quietly pursue their goals. Other personality traits include industriousness, prudence, and frugality; yet sometimes overly anxious in acquiring things. They are proud, but need encouragement. Those born under this sign are easily influenced by their surroundings; and are often intuitive and mediumistic. They are greatly attached to home and family. They can be very changeable, subject to the phases of the Moon. People born under the sign of Cancer can be inclined towards jealousy, can be subject to periods of depression and fear. Cancer people are compatible and harmonize best with Virgos, Scorpios, or Pisces; and reasonably well with Aquarius or Taurus. Cancerians succeed best in careers requiring persistent effort combined with patience, such as business management. People born under this sign can do well in certain medical and service industries. Cancer people want to live near large bodies of water. They do not like cities. Seaside or very large lakes. Large bodies of water are the key. Shady places are also a preference. Cancerians do not adapt well to noisy, city environments. However, it is recommended they live in corner houses. The ruling gemstones of Cancer are Emeralds and Moonstone. 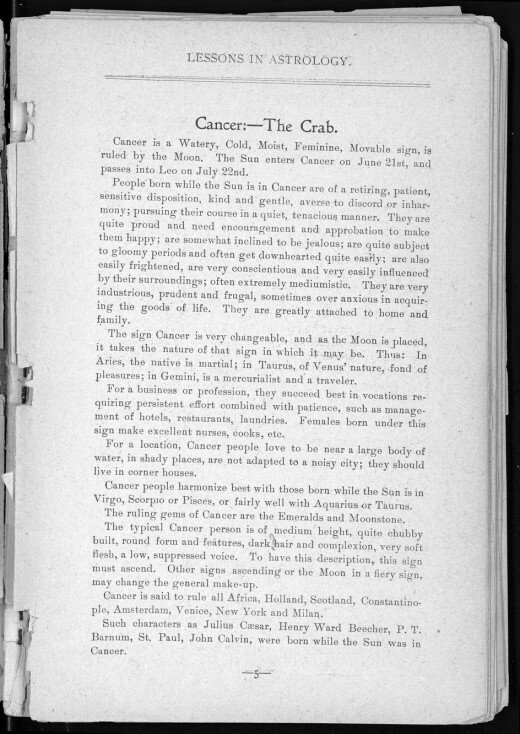 Cancer is said to rule all Africa, Holland, Scotland, Constantinople, Amsterdam, Venice, New York and Milan. Leo is fixed, fiery, masculine and barren sign and is ruled by the Sun. The Sun enters Leo on July 22d and passes into Virgo on August 22nd. The Leo personality is active minded and fearless. Though good-natured, generous, and slow to anger; this sign can become furious when their temper is aroused. Fortunately, this is usually a rare occurrence. Other personality traits include determination and persistence; seldom becoming discouraged. They are natural leaders and resistant followers. This personality is very independent. They keep their affairs to themselves, especially as to finance and love. They are also industrious, honest and conscientious. This sign always looks to their own interests, usually resulting in being more fortunate than the average person. Leos make friends easily and often have magnetic personalities. Sun sign people are compatible and harmonize best with the Gemini, Libra, Sagittarius and Aries. There is extreme disharmony with those born under the Sun with the water or earth sign. The Leo person, as a rule, has a strong constitution and good vitality, but often dies suddenly from overexertion. The Leo is well adapted for careers requiring sympathetic and magnetic force. Some people born under this sign are excellent orators, elocutionists, lecturers and inspirational speakers. Many are military leaders and politicians. The country. More specifically, the country life and plenty of fresh air and the wide-open spaces. However, they often avoid the Sun when in the city. The Leo person wants lots of room. When forced to live in the city, Leos want shady places during the day and wide open skies at night. The ruling gems of Leo are the Sapphire and Diamond. Leo is said to rule France, Italy, Rome, Sicily, Bohemia, Bath, Ancient Chaldea, and Philadelphia. 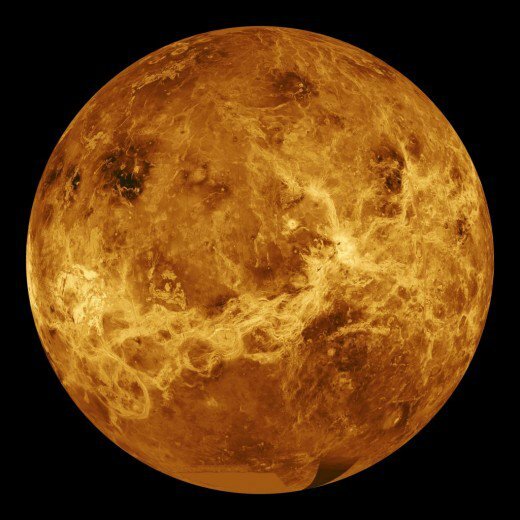 Virgo is of the earth, changeable, feminine, cold and barren. 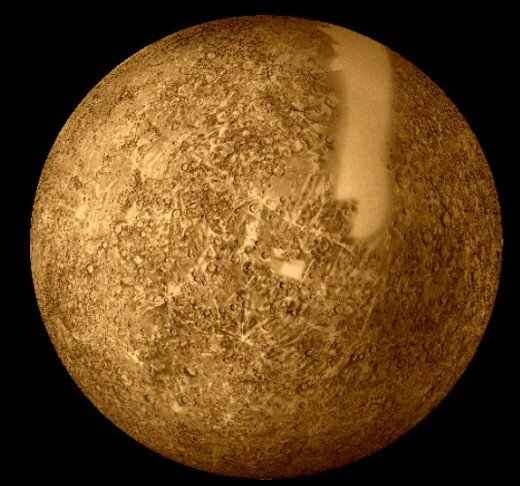 This sign is ruled by Mercury. The Sun enters Virgo on August 22nd and passes into Libra on September 22nd. The Virgo personality is modest, thoughtful, contemplative, industrious and refined. They are often very changeable in their opinions and are very sensitive. Has a love of nature and very strong likes and dislikes. They are persistent, yet inconsistent. When it comes to food, people born under this sign are known as discriminating and picky eaters. When unhappy, angered, or stressed they lose their appetite and wish to be alone. Other traits include not being easily discouraged, very industrious, and seldom being contented. They are quick learners and are intuitive. The Virgo loves money, but has no ability to accumulate or save it. They are often critical of others and consequently creates unnecessary enemies. People born under this sign generally have a lack of confidence. Their personality can also be quick tempered, and is often dissatisfied. The Virgo is compatible and harmonizes best with Capricorn and Taurus; and gets along well with Scorpio and Cancerians. The Virgo has good endurance and does not show their age. People born under this sign are prone to digestive-tract problems. Virgo people succeed best in occupations not requiring physical labor. They succeed at writing, painting, decorating, etc. Many born under this sign have unusual talents and inventive genius. Has an affinity for scientific studies and are often successful in the medical profession. When under a deadline, they can apply themselves to meet almost any demand. 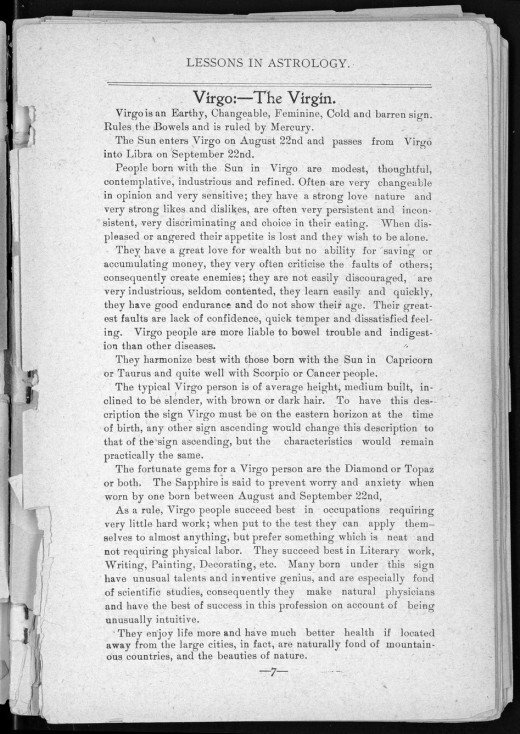 'The Virgo enjoys life more and has much better health away from metropolitan areas. They prefer the mountains, countryside, and nature’s natural beauty. Virgos want to live where nature is abundant, mountainous country being their primary choice. City living actually appears to be deleterious to the Virgo's health. The gems for the Virgo are the diamond and topaz. For many of this sign, the sapphire is said to prevent worry and anxiety. The emerald represents the positive aspects of the planet Mercury. 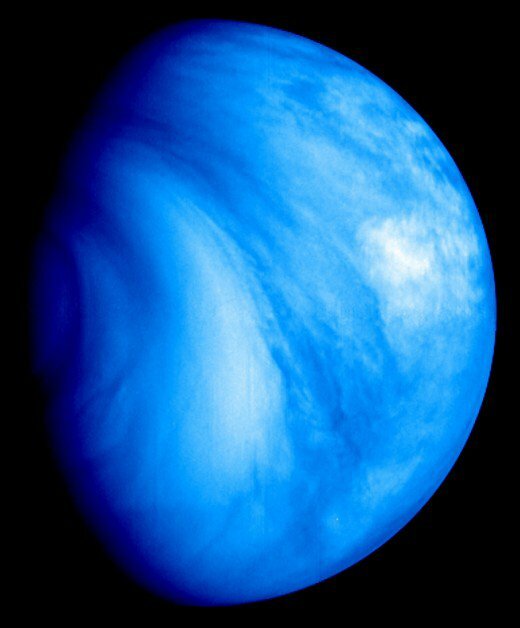 Venus via the ultraviolet spectrum. Known as an airy, movable, masculine, cardinal, equinoctial sign and is ruled by Venus. The Sun enters Libra on September 22nd and passes into Scorpio on October 23rd. Libra personality traits include generally being thoughtful and contemplative. They usually analyze whatever gets their attention. This personality is very imaginative and prone to build dream castles in the air. They are intuitional, but tempered by reason. They are modest, neat and particular; disliking dirty work, have average ambition. Other personality traits include being affectionate and often marrying very young, many marry more than once. They like music and art, etc. People born under this sign are known for an even temper. They dislike discord and disharmony. The Libra can be generous to excess. Can be too easily influenced by others. If not careful, their trusting nature can lure them to bad financial and/or business decisions. Libra people are compatible and harmonize best with Aquarius and Gemini; they also get along with Leo and Sagittarius. They should never marry an Aries, Cancer, or Capricorn. 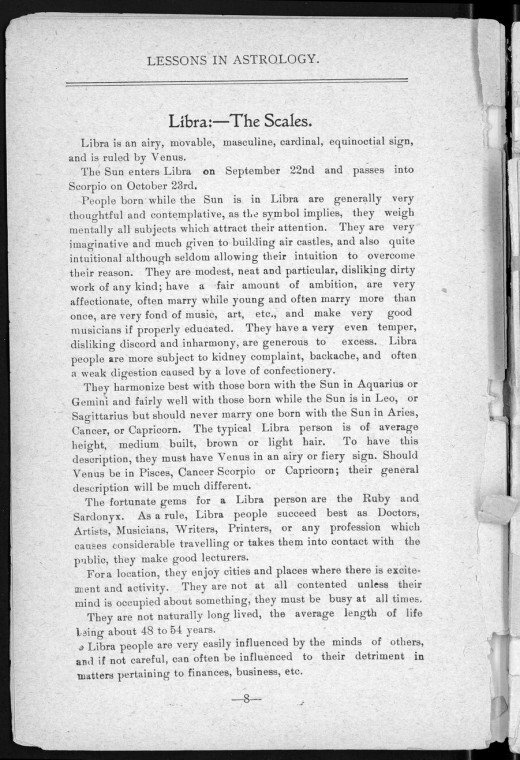 Libras are best suited to be doctors, artists, musicians, or writers. They can also be good in careers that require traveling, public speaking, and contact with the public. Many become musicians when given the chance. Cities and other places with lots of activity and excitement. The Libra wants an environment where they are kept busy and occupied at all times. Lots of action seems to be the key to a Libra's happiness.They are discontent unless their mind is kept occupied. They want to be active all the time. Libra people are subject to kidney problems, backaches, and digestion problems (often caused by a sweet-tooth). They are not long lived, but are average. The fortunate gems for persons born under the Libra sign are ruby and sardonyx. The cold, feminine, fruitful, fixed sign. 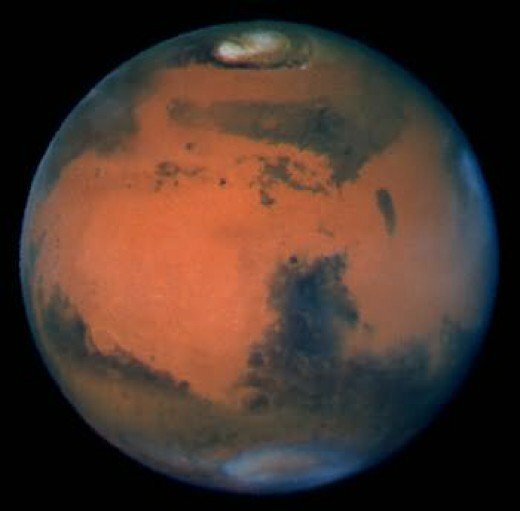 This sign is ruled by Mars. 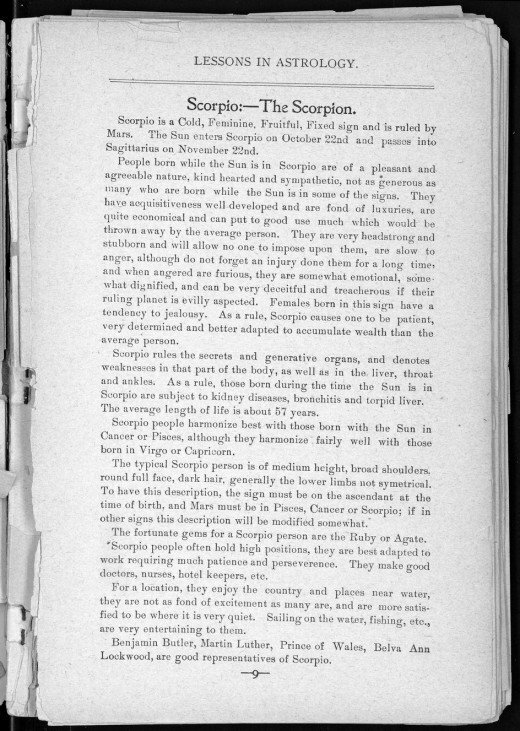 The Sun enters the sign of Scorpio on October 22nd and passes into Sagittarius on November 22nd. The Scorpio personality is pleasant, agreeable, kindhearted and sympathetic. They like to acquire things and love luxury. Yet, the people born under this sign are quite frugal and economical. They are known to find uses for things that others would throw away. The Scorpio personality will not permit imposition. Though slow to anger, does not forget an injustice for a long, long time. When angered, they become furious. Can be both emotional and dignified. Some are deceitful and treacherous. Generally; they are patient, very determined, and better adapted to accumulate wealth. People born under the sign of Scorpio are not known for their generosity. Can be headstrong and stubborn. A female trait is jealousy. Scorpio people are compatible and harmonize best with Cancer and Pisces. They get along well with Virgo and Capricorn. The gems and birthstones for Scorpio are ruby and agate. Scorpio rules the secrets and generative organs, and denotes weakness in that part of the body. May have throat and ankle problems. As a rule, those born under this sign are subject to kidney and liver disease and bronchitis. Scorpio people often are executives and politicians. They are also suited for work requiring patience and perseverance. Those born under this sign can make good doctors, nurses, or front line managers, etc. The countryside and living in places near water. Peace and quiet are the ruling preferences for Scorpios. The more peaceful and quieter, the better. In other words, Scorpios are not fond of and avoid excitement. The Scorpio likes sailing and fishing. The hot, fiery, masculine, barren and common sign. 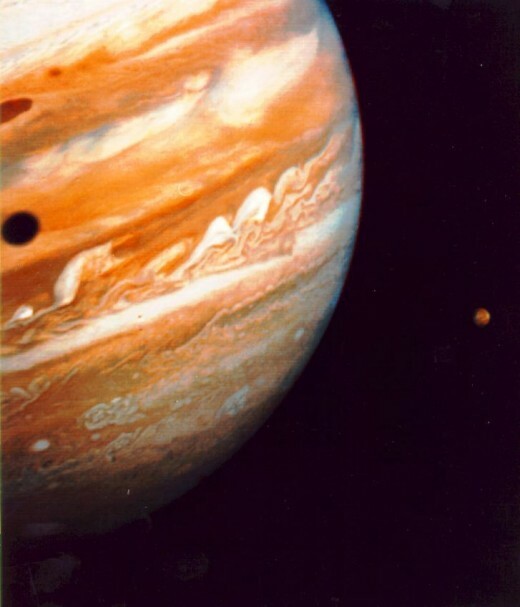 This sign is ruled by Jupiter. 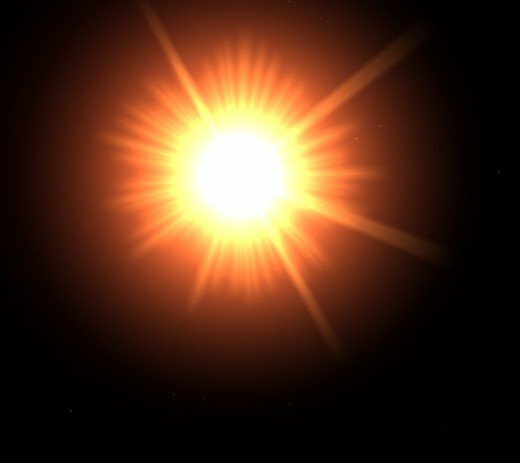 The Sun enters Sagittarius on November 23rd and leaves into Capricorn on December 21st. Sagittarius people are jovial, generous, and charitable. Those born under this sign are natural leaders. Other personality traits include being ambitious, persevering and not easily discouraged; known for foresight, strong willpower, and the ability to influence others. Known for dignity and self esteem, yet are seldom conceited. Likes sports, outdoor exercise, and horse riding. This personality has a propensity to be able to control animals. The Sagittarius personality is very resistant to being “ordered around”. Being an employee in certain kinds of jobs is not always the best option for the Sagittarian. Sagittarius people are compatible and harmonize best with Aries and Leo. They also get along well with Libra and Aquarius. The gems associated with the Sagittarius are amethyst and jasper. Sagittarius people are known for their foresight and “intuition” as a result of their natural calculation abilities. They have many talents. People born under this sign are musicians, writers, artists, and sculptors. Some are mechanics. Some are inventors. Many are experts in their professions. Often are managers, cashiers, and accountants. Sagittarius people prefer mountains and countryside. They have an extreme dislike for crowding and small living-quarters. Rough, mountainous country. The Sagittarius is actually claustrophobic in cities or anywhere else where they might be crowded into small places. And apparently, living in a singles apartment is out of the question. 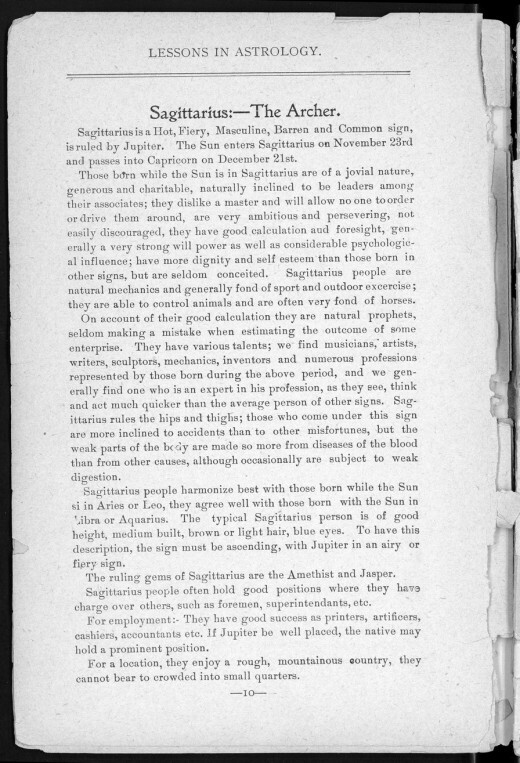 Sagittarius people are accident-prone and are often subject to diseases relating to the blood. They may have digestion related problems. Capricorn is earthy, movable, feminine, cold, equinoctial, and thoughtful. 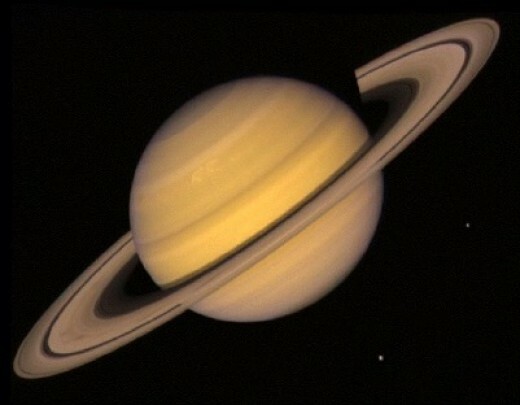 This sign is ruled by Saturn. The Sun enters Capricorn on December 21st and passes into the sign of Aquarius on January 20th. Personality traits are quiet, thoughtful, deep-thinkers, and have good reasoning abilities. Capricorns are practical. Those who are born under this sign are dignified, neat, particular, and artistic. They are more ethical than most. Capricorns are ambitious, persevering, and resistant to being discouraged. They are born to multi-task. They are often successful at planning grand schemes. 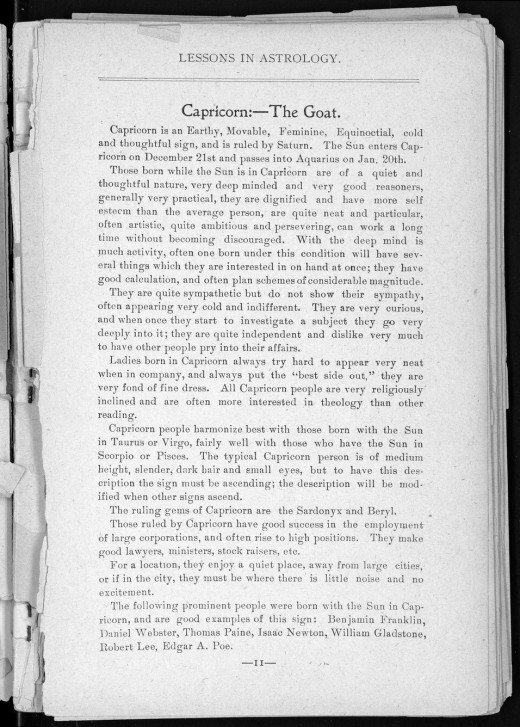 Capricorns are known to have a very sympathetic nature, but do not show it; this results in them falsely appearing cold and indifferent. They are curious and will sometimes tenaciously investigate a subject. People born under this sign are independent and very private. The lady Capricorn always tries to appear at her best. Many Capricorns are very religious. Capricorn people harmonize and are most compatible with Taurus and Virgo. They also get along well with Scorpio and Pisces. The Capricorn thrives in the corporate environment, often rising to the upper echelons. They make good lawyers and ministers. Quiet places, away from large cities. Those born under the sign of Capricorn avoid metropolitan areas whenever possible. The Capricorn must live in an environment where there is no noise or excitement. In other words, busy or high activity locations are anathema to the Capricorn. The ruling gems for the Capricorn are sardonyx and beryl. This sign is fixed, airy, masculine, warm and humane. People born under this sign are ruled by Uranus (the occult planet). 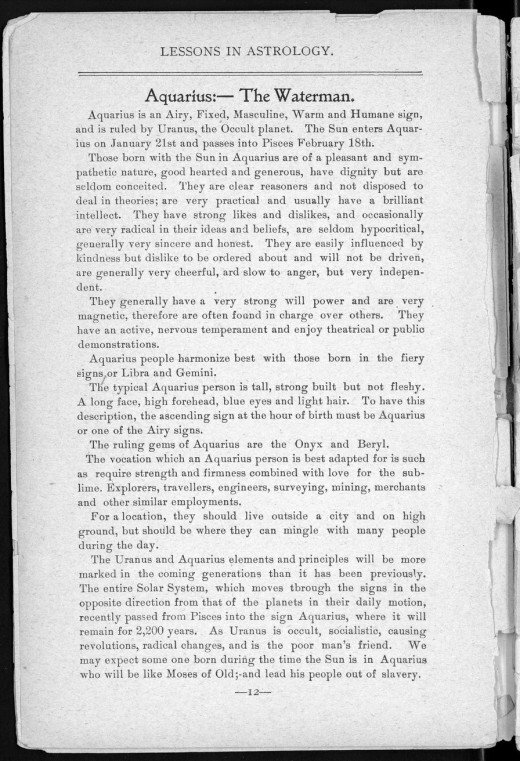 The Sun enters Aquarius on January 21st and passes into the sign of Pisces February 18th. Personality traits include being pleasant, sympathetic, goodhearted, and generous. They have dignity without conceit. People born under this sign are practical in logic and not inclined to deal in theories. They are pragmatic and usually have a brilliant intellect. The Aquarius personality trait can have strong likes and dislikes. Sometimes they are radical in their ideas and beliefs. People born under this sign are seldom hypocritical; instead they are sincere and honest. This sign is easily influenced by altruism, but is also independent and won’t be ordered around. They are usually cheerful and slow to anger. People born under the sign of Aquarius usually have strong willpower and magnetic personalities; this often leads to leadership roles. The Aquarius personality trait is said to be of active/nervous temperament and participate in theatrical or public demonstrations. Can be nervous at times. Aquarius people harmonize and are compatible best with the Libra, the Gemini, and those born under the fiery signs. The gems of Aquarius are onyx and beryl. The Aquarius person is best suited for careers requiring strength/firmness, combined with love for the sublime. Careers include exploration and traveling, engineering, surveying, and mining. Many of this sign are merchants, also known as owning their own retail businesses. Aquarius people do best in the suburbs, i.e., outside a city (preferably high ground), but still able to mingle with lots of people during the day. Towns, but definitely not cities. High ground also seems to be a specification. As for the town versus city semi-paradox; the Aquarius likes to mingle with people during the day, but only up to a certain point and not at night. This is the Age of Aquarius and it will remain so for the next two millennium. 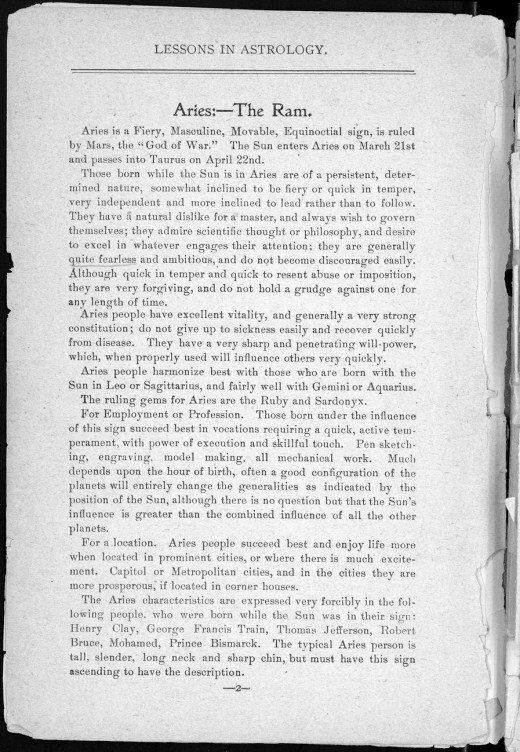 The final (Editor’s note: circa 1901) paragraph in the manuscript below addresses this phenomenon in interesting detail. Pisces is a watery, feminine, and fruitful sign. 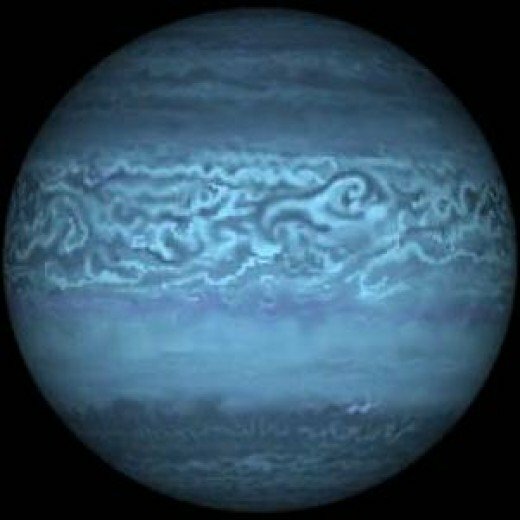 This sign is ruled by Neptune (the planet of inspiration and idealism). The Sun enters Pisces on February 19th and passes into the sign of Aries on March 21st. Personality traits include being generally kind, loving, and tend to be easy going. They seem to handle misfortune well. Those born while the Sun is in this sign are imaginative and idealistic. They are studious, logical, and methodical. Pisces people are mathematical and will engage in scientific reasoning when they set their mind to it. They avidly pursue knowledge; following their research with untiring dedication. Pisces are captivated by music and beautiful scenery. Once they make up their mind, they have great determination in reaching their set goal. Conversely, lack of confidence often prevents them from starting a project that they very well could have accomplished. Those born while the Sun is in Pisces sometimes speak spontaneously without thought to the possible consequences. They often lack self esteem; causing hesitation in presenting their point of view when necessary. Their personality can be generally timid and modest, can be easily influenced to tears. May lack self-confidence. Pisces people harmonize and are best compatible with Cancer and Scorpio. They also get along well with Taurus and Capricorn. Pisces people are good at professions requiring discretion, intuitive judgment, and the ability to make the best of a bad situation. Career affinities could include legal, politics, and other professions where the ability to keep a secret is essential. People born under the sign of Pisces prefer locations near the ocean or other large bodies of water. 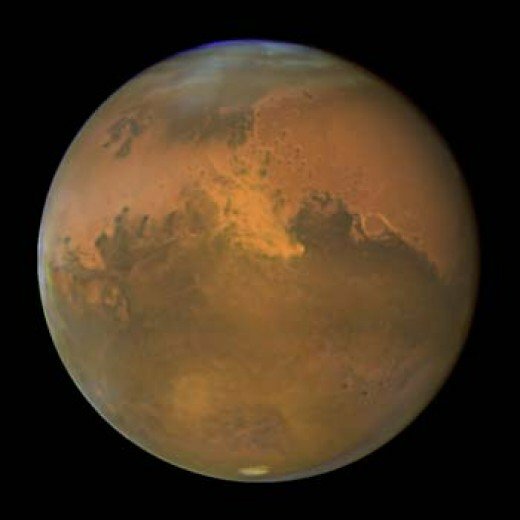 Though cities don't seem to be excluded, the Pisces also likes rough and mountainous areas. The fortunate gems of Pisces people are amethyst and jasper. This is the Age of Aquarius and it will remain so for the next two millennium. The former age was that of Pisces. The final (Editor’s note: circa 1901) paragraph in the manuscript below addresses this phenomenon in interesting detail. A planispheric astrolabe from the 14th century. 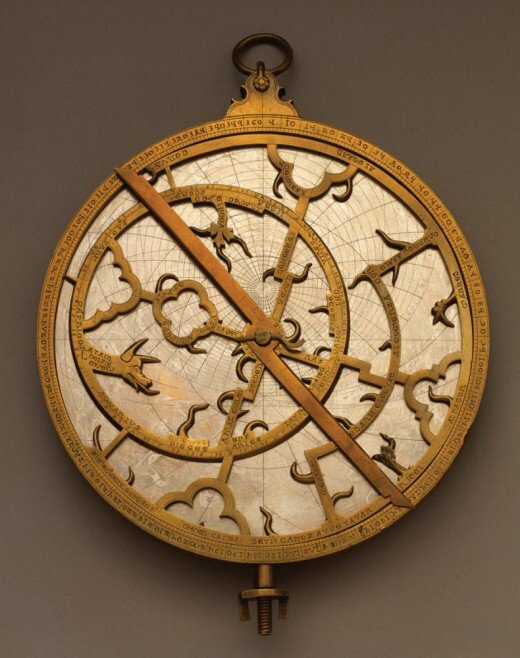 Used for timekeeping, surveying, astrology, and navigation in the 14th century and beyond. Welcome to the Website With No Name. Information you can use and other worthy items, even a little humor and entertainment. Homepage explains all. Article original publication dates range from 2011-2019 and are updated as new information becomes known. Main Menu - All pages year 2019 updated. Do note the apparently required legalese at end. This website and the articles herein are accurate and true to the best of the author’s knowledge. Content is for informational/entertainment purposes only and does not substitute for personal counsel or professional advice in business, financial, medical, legal, technical, or anything else this website may have mentioned. It should also be noted that most of the articles here are my personal opinions/experiences/research and many times link to US federal websites to provide further substantiation and/or additional information. Regarding EEA/GDPR, this website has no interest in visitor personal data. However, upon consent or continued usage, Google might. Copyright © 2019 (excluding public domain images). websitewithnoname.com. United States of America. Powered by Blogger.